Super steamy summerlike days remind me that it's time to leave my usual environs in the South, and head to the Pacific Northwest with its beautiful views, mild weather, and cool breezes. Since 2006 I have spent my summers in Port Townsend, Washington, a Victorian seaport and artist community situated at the tip of the Olympic Peninsula. At my summer studio on a bluff overlooking Port Townsend Bay I can view both the Olympic and Cascade Mountains. In the distance is the mouth of Puget Sound where it opens to the Strait of Juan de Fuca, just below the San Juan Islands. This is the perfect environment to sketch, plan and create. The picturesque backyard is just right for everything from photo shoots, to relaxing, to planning my next collection. I call this funky gate my gateway to heaven! It leads to a secret garden on the bluff overlooking water, mountains and blue skies. "And the livin' is easy" there. My one summer "must have" in clothing is this poncho by Apiece Apart, perfect for those chilly evenings when the winds come in across the water. 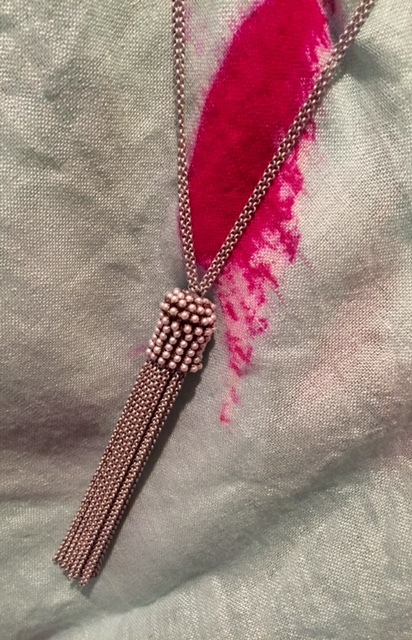 If asked about my "go to" summer necklace, I would have great difficulty deciding, but our ever popular Cordell tassel necklace would certainly be high on the list. Love its simple, chic vibe. Because I am Northwest bound, I would have to don our specially crafted deer horn earrings. Embellished by Myrna Halpern Jewelry, but obtained from our "Northwest Man." He forages the woods for shed antlers and polishes them for us. STAY TUNED TO THE BLOG THIS SUMMER AND FOLLOW MY CREATIVE ADVENTURES IN BEAUTIFUL PORT TOWNSEND, WASHINGTON. Posted on June 11, 2016 by Myrna Halpern.